Hey Guys! 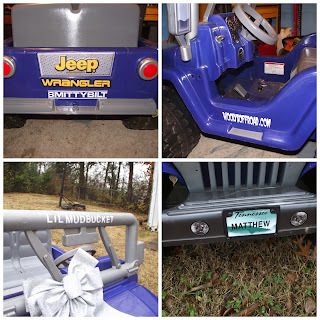 This post is all about Matthew's Jeep! I got so lucky when I stumbled across a friend's post on FB about selling a Jeep Power Wheels. It was only $75, which is a huge steal! As soon as I saw it, I snatched it up. It sat at JP's house for several months waiting on us to decide what to do with it. This is what the Jeep looked like when we started. For some reason, I forgot to take pictures until we had already started taking out parts to paint them. Oops. But, the seat and dashboard were all tan just like the steering wheel. This thing was also super dirty! I guess it had sat in her storage for quite a while. We started out by removing all the pieces that we could that would need painting. Then wiped the whole thing clean. The next step was painting. 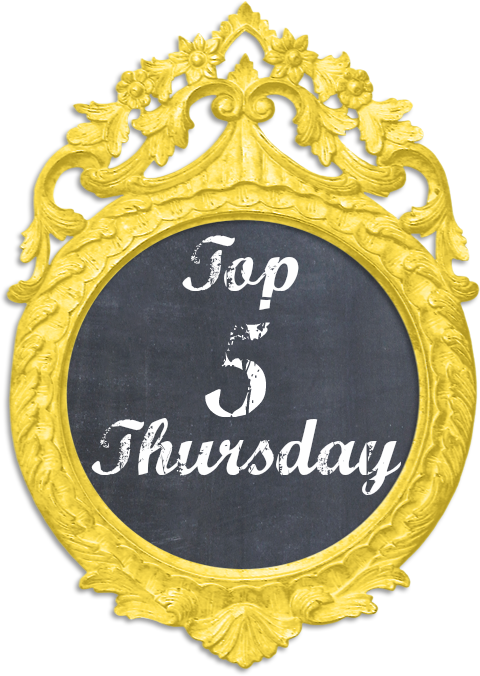 We painted several things on here: the seat, the dashboard, the back bumper, the steering wheel and the steps on the sides. 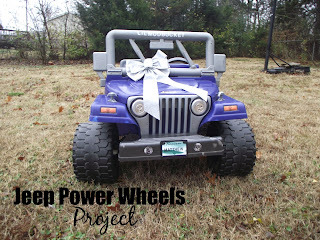 We started off by taping everything that we couldn't take off of the Jeep and removing the things we could. Then I scratched the surface of all of the pieces we were painting and JP sprayed them down with adhesion promoter. Last step was painting them all with a silver grey paint and letting them dry. Then, we added working lights. This was so easy! We found these lights at dollar tree and they happened to fit perfectly in the front light spot. They are pretty darn bright too! Then we went to Walmart and bought red tail light tape and added it to two of the lights to make the tail lights. 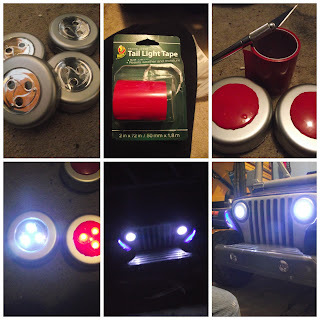 The lights come with an adhesive on the back already and once we attached them, they were still easy to pull the front part off and swap the batteries out. Lastly, we added some personal touches. We had to have a license plate with Matthew's name on it of course! And then we added several decals from Jeep companies that we love. The last thing I did was add "Lil Mudbucket" to it. So there you have it! 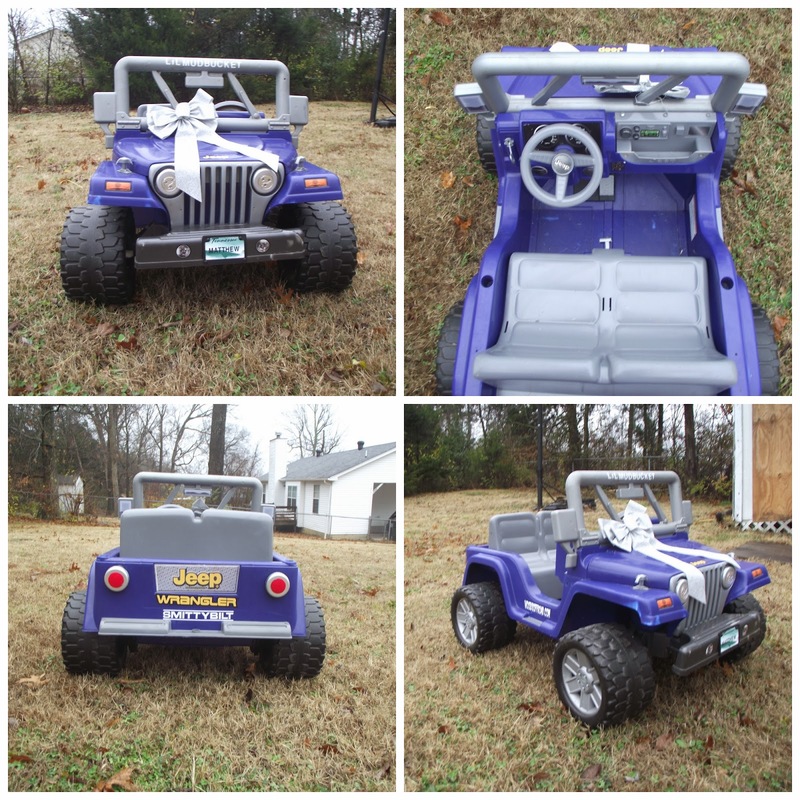 It really took us only a few hours to make the changes to this Jeep, but it was totally worth it and Matthew was so excited when he got it on his birthday.